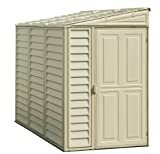 We are briefly explaining some of the terms you may come across when buying wooden garden sheds. Covering things such as roof shapes, construction materials and some of the different names for various parts of a shed. An apex roof shape is when there is a ridge running along the length of the shed with the roof section sloping upwards from either side meeting at the ridge. This is a very popular choice for many because of its traditional and attractive appearance. A Penta roof shape is when there is a single roof section sloping in one direction. It usually slopes towards the back of a building which encourages any rainwater to run off in that direction. This style often creates generous headroom and also lends itself to being put up against a wall or fence. A lot of garden sheds are finished with a factory applied or dip treated finish which has an orange color. It will quickly fade. These sheds will need to be regularly retreated to protect them against rot. There are some sheds on the market that have been built with timber that has been pressure treated. This timber has the anti rot treatment forced into it at high pressure and will therefore withstand water and fungal attack. In fact these products often have a 15 year guarantee against rot. One of the best things about them is that you don&#8217;t have to spend time retreating them every year. Generally sheds are built in the shiplap or overlapped timber. Shiplap is a name given to the interlocking tongue and groove boards that are used in the construction of some sheds. As the name suggests the boards are blocked together and when fixed horizontally onto a frame. This material offers greater protection from the wind and rain. Overlap is the term given to the rough sawn feather edge timber boards used to construct the majority of garden sheds. These overlapping boards will have been sawn from UK grown timber such as larch or spruce. The eaves of a shed are the projecting overhang at the lower edge of a roof. They overhang to make sure that any rainwater running off the roof doesn&#8217;t seep inside the building. A gable end is a triangular section of wall at the end of the pitched roof occupying the space between the two slopes of the roof. Barge boards or fascia boards are flat trim boards that follow the pitch of the roof. They create a neat finish but also protect the edge of the roof from the effects of the weather. Cover strips are flat trim boards that cover and protect where two panels join as well as providing a neat finish to the shed. They also stop any water seeping in through these corner joints. Floor bearers or joists are usually pressure treated timber beams that run the full length of the shed They support the base of the shed but also raise it off the floor and protect it from groundwater and damp.